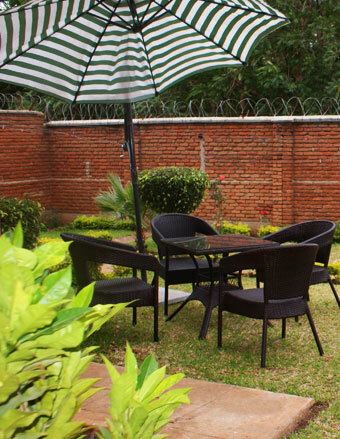 Top Lodge in Blantyre presents a choice of 12 executive rooms all of which self –contained equipped with satellite television, internet and other facilities. They range from standard to deluxe to give our guests a choice for their comfort. The lodge has modern kitchen and restaurant facilities equipped to provide hotel standard cuisines to guests. Our endeavour is to provide a wide variety of food and beverages of satisfy our guests. The menu carries a service promise for European, Asian, African cuisine among others. Our creativity enables us to offer other dishes never seen anywhere else because Malawi offers the uniqueness with the endowment of its fish from Lake Malawi such as Chambo. The lodge has a conference capacity of 40 people and a board room for 10 people. The lodge provides guest transport as a separate service at internationally competitive rates. For example, airport pick-up does not cost any more than it does in major cities of the world. Guests who would like to take a tour of Malawi are given a rare chance to self-drive or hire our own vehicles to explore the countryside. Malawi, popularly known as the Warm Heart of Africa,offers a unique of experience of the most friendly people you can ever meet in the world. The countryside has unique mountains, game, vegetation, and tradition. Lake Malawi, the second largest fresh water lake in the world, offers a rare experience in tourist travel. We believe our guest would like to use our services to take them to see Malawi. This is both washing and dry cleaning at a separate but highly competitive charge. Business services such as internet, telephone, printing, photocopying, and sale of mobile phone airtime is available to our guests for their convenience. All rooms are equiped with wireless internet service.